The purpose of the Orléans Sister City Association is to support endeavors that further the exchange of cultural awareness leading to a positive and supportive relationship and mutual appreciation of our individual traditions. New Orleans and Orléans signed a sister city agreement January 5, 2018. (Article Orléans and New Orleans: Sisters at Last). Sister city relationships depend on genuine human connections between individuals (not just official governments) and are commonly fostered through auxiliary associations to encourage cultural exchange, travel, collaborations and mutual friendships. 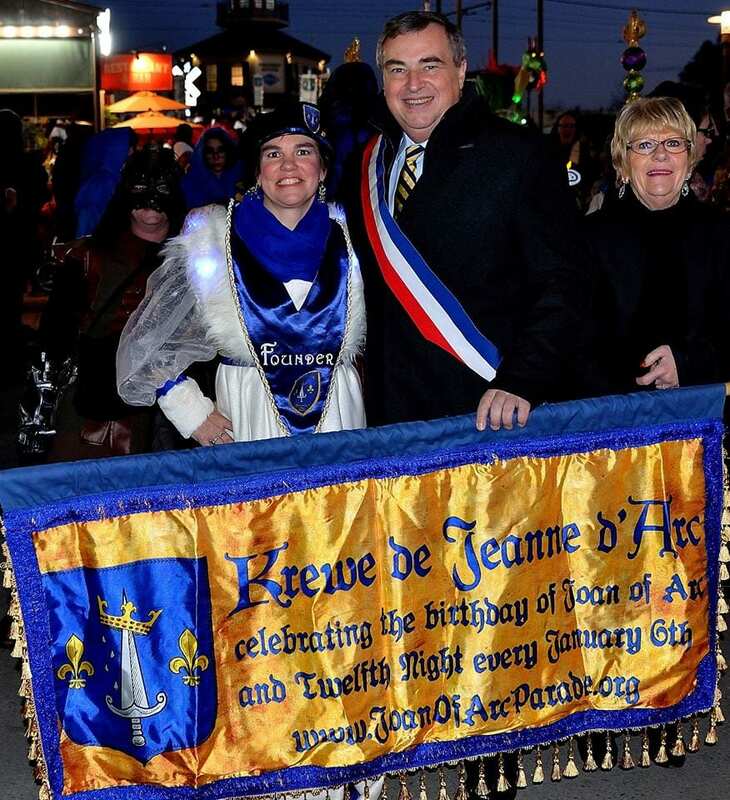 The Krewe de Jeanne d’Arc intends to plant the seed for such an association and will maintain separate fund records for sister city projects. The Orléans Sister City association will have its own events and e-newsletter and may eventually get large enough to have its own leadership and spin off from the krewe. The $25 Orléans Sister City Association membership is open to anyone who has an interest in being part of the sister city connection. Membership is separate from Krewe de Jeanne d’Arc membership and does NOT include parading privileges. We have a role model for our association and a partner on the French side, in the Orléans-Wichita-New Orleans Association, headed by Laurent Doisneau-Herry. Orléans already had this cultural association in place to handle their previous American sister Wichita, and now it will expand to support the connection with New Orleans as well and will be our liaison. Mayor Mitch Landrieu and delegates from the City of New Orleans visited Orléans in November 2017. Then a delegation from Orléans visited here, including Mayor Olvier Carré, and the sister city agreement was formally signed here in New Orleans January 5, 2018. (Article Orléans and New Orleans: Sisters at Last). More news articles on our Press page. Joan of Arc’s first military victory was to break the English siege of Orléans, France, in 1429. Orléans was the last holdout against the English in the heart of France, and Joan’s victory turned the tide of the Hundred Years War in one of the greatest military comebacks in history. 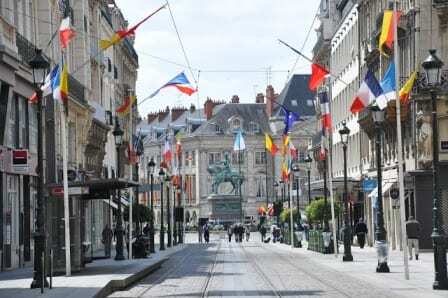 Since 1430 Orléans has celebrated Joan’s victory with an annual festival in her honor. United by our shared devotion to Joan of Arc, the Orléans delegates attended the New Orleans Krewe de Jeanne d’Arc pre-parade dinner January 5, marched at the front of the New Orleans Joan of Arc parade January 6 (Joan’s birthday), and brought 4 costumes from the Orléans Joan of Arc parade which were worn by Krewe de Jeanne d’Arc members for the 2018 New Orleans parade. Krewe de Jeanne d’Arc leaders joined other cultural ambassadors of New Orleans in the Orléans’ annual Fête de Jeanne d’Arc May 6-8, 2018, and paraded in costume in the Orléans parade. Guests from the sister city association in Orléans, France, visited New Orleans in September, and participated in the annual Salon de Jeanne d’Arc conference. Plans are in the works for a New Orleans event in connection with the May 8, 2019, Joan of Arc parade in Orléans. Krewe de Jeanne d’Arc Captain and Founder Amy Kirk Duvoisin with Orléans Mayor Olvier Carré for the 2018 Joan of Arc parade in New Orleans. Jean-Pierre Gabel, Orléans city council member in charge of the Fête de Jeanne d’Arc, thanks the Krewe de Jeanne d’Arc for the gift of handmade throws for the Orléans delegates.